Once the former capital of Vietnam and the home of Vietnamese royalty, Hue is surprisingly less touristed than the neighbouring cities of Hoi An, a charming town with a quaint old town centre, and the busy transit hub of Da Nang. 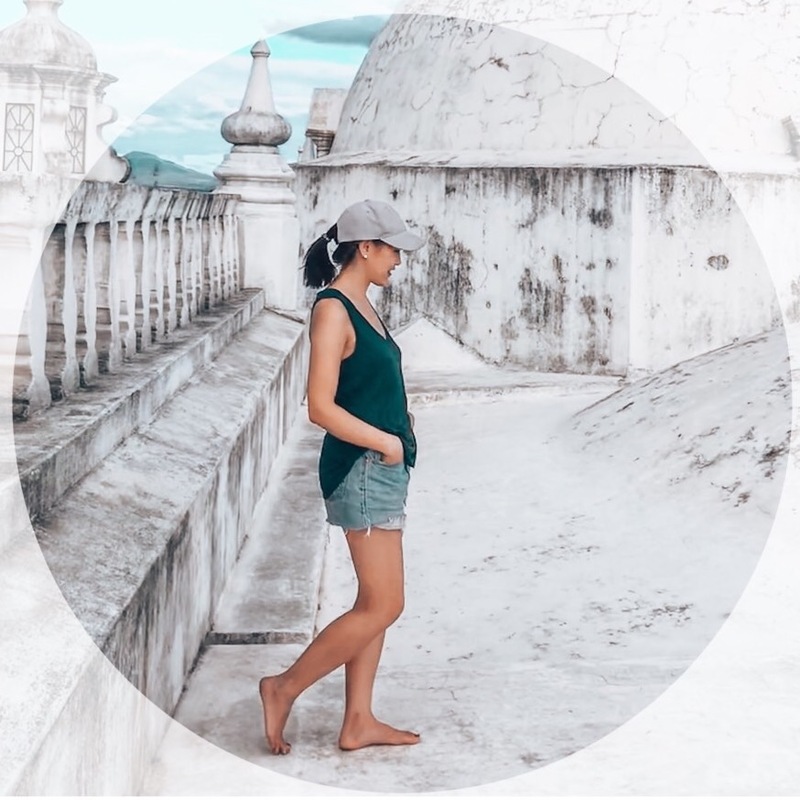 But, for the travellers who do make it to Hue, everyone will tell you that the city feels more “real” and a city that’s great to eat in — maybe even more so than the rest of Vietnam. The city, with its imperial background, once hosted royal chefs and is known for dishes fit for a king. If you visit Hue in Vietnam, the best thing to do is just EAT. 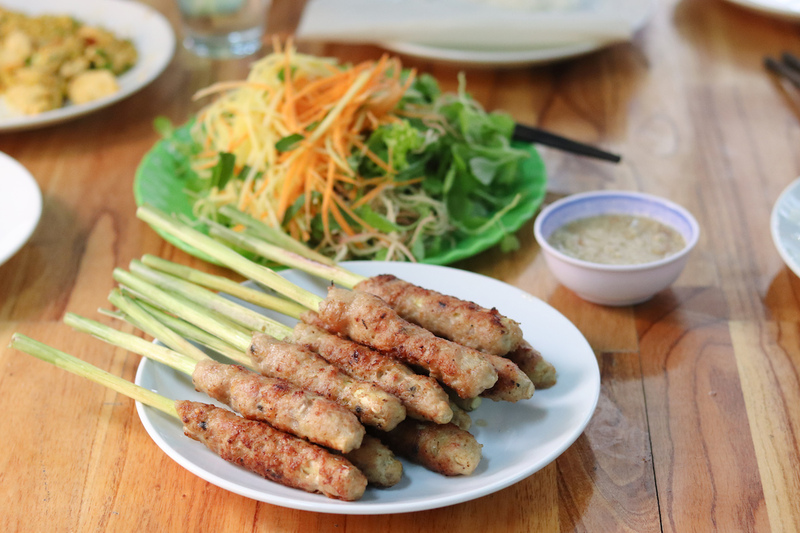 And, when you’re done eating, take a cooking class, and learn how to prepare Vietnamese recipes on your own! 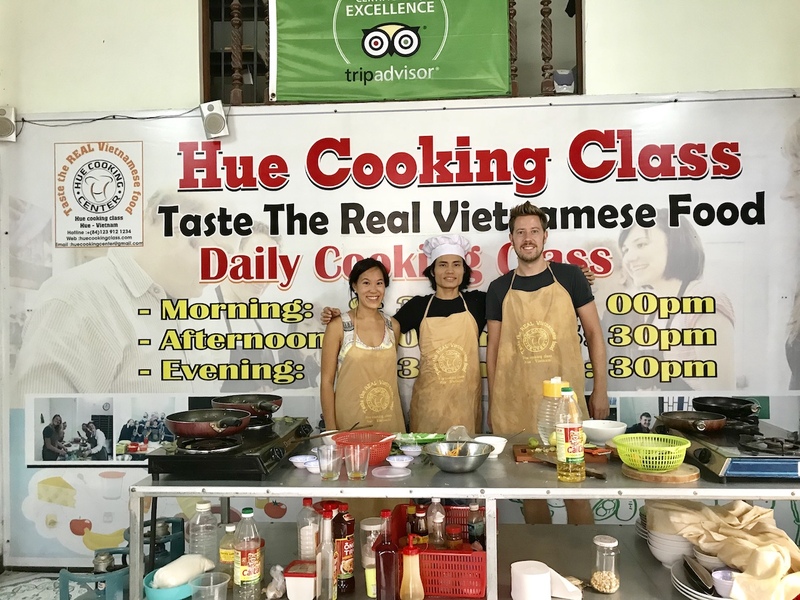 We signed up for a cooking class with Hue Cooking Class / Anh’s Cookery, the top rated cooking class in the Classes & Workshops category on TripAdvisor. 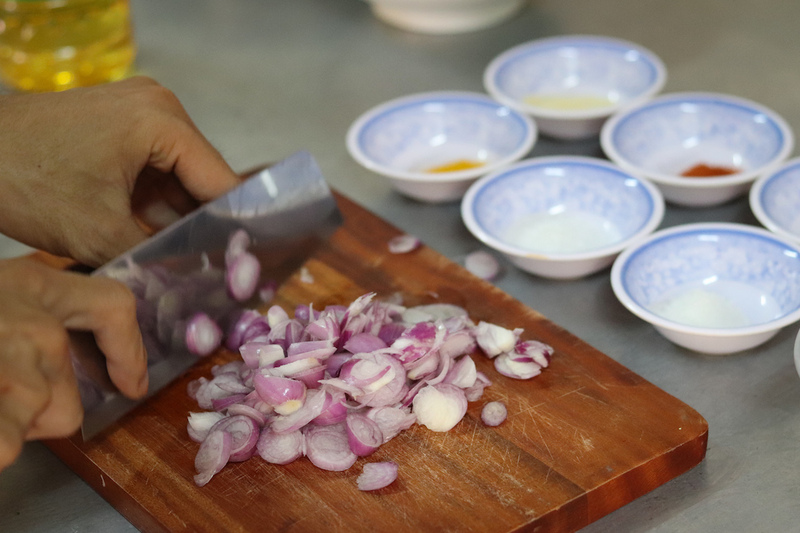 Our tour and Vietnamese cooking lesson was led by Anh Phan, the owner of Hue Cooking Class. Born and raised in Hue, Anh worked for years in a Vietnamese restaurant before starting his own part-time cooking class and food tour in 2014. 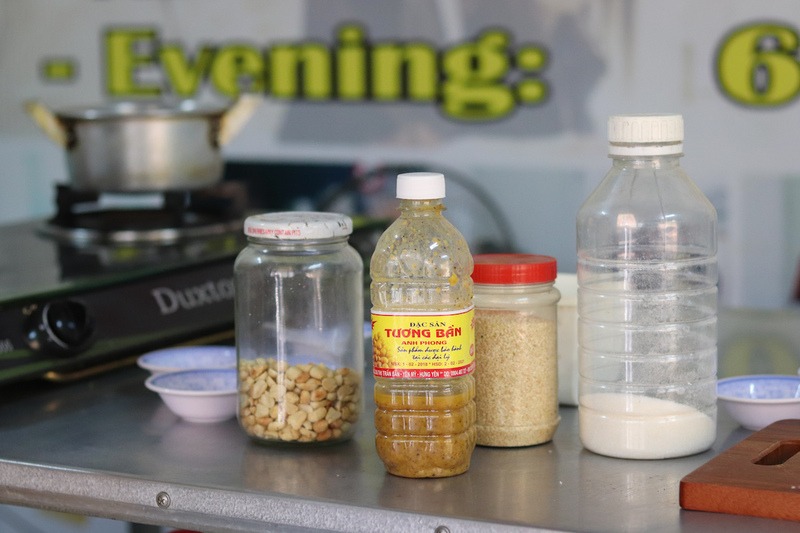 It was only a year ago that his cooking class gained enough popularity to become his full time occupation, and now, he hosts at least ten cooking classes a month for travellers from around the world. Our morning began at Dong Ba Market where we watched Anh shop for the groceries which would soon be prepared by us into lunch. We then went back to his home, which doubles as his cooking class headquarters, to begin our class. We made three popular Vietnamese dishes: mango salad with prawn, ground pork on lemongrass skewers, and a lemongrass chicken stir fry. Most of the prep work (washing, measurements, deboning, meat grinding, etc.) was done by Anh. 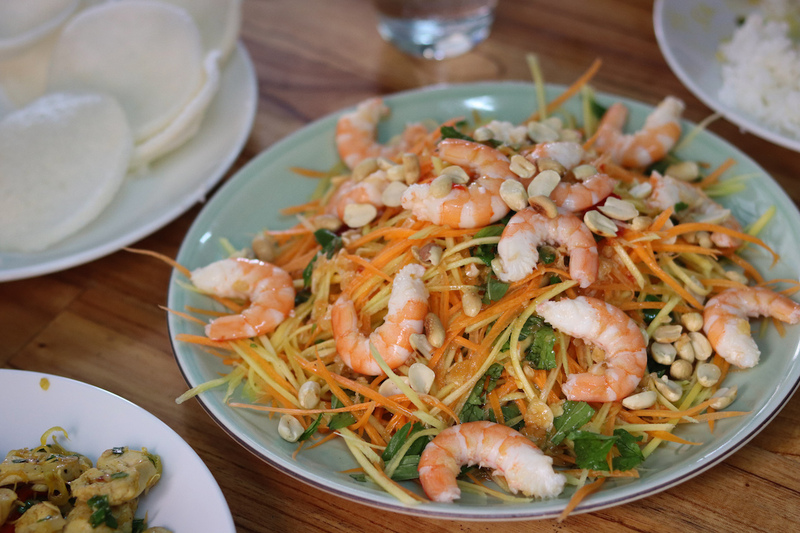 At his direction, we shredded the carrot and papaya, picked herbs (spearmint, peppermint, basil) off the stem, and mixed up a fish sauce salad dressing with garlic and chilli. 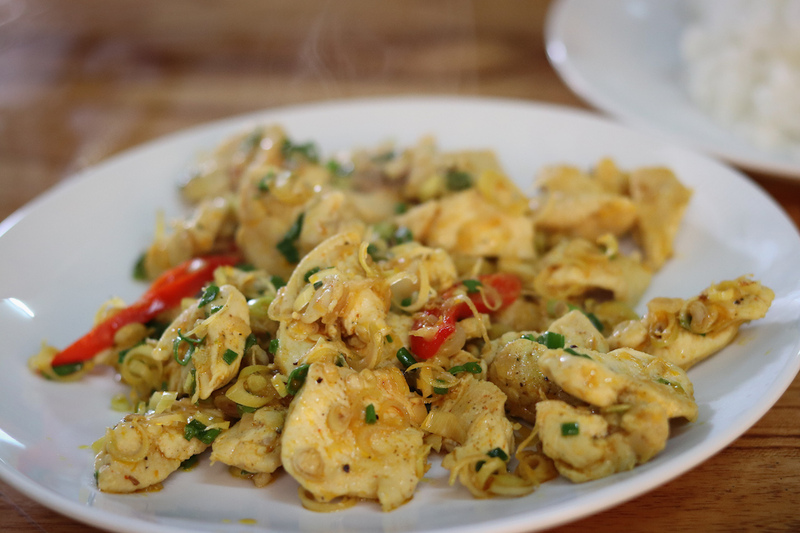 We diced the chicken, finely sliced the lemongrass, pounded the peanuts, and stir fried the ingredients together. 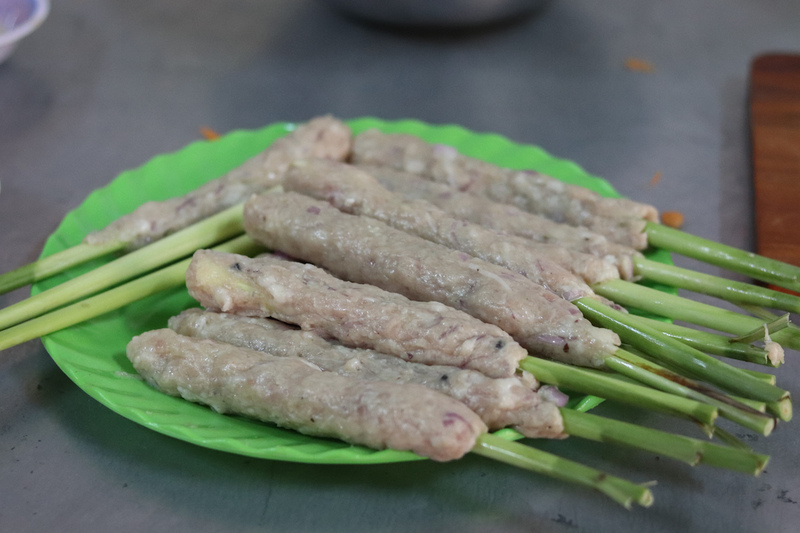 The pork was pre-ground for us, but I enjoyed experiencing the technique of molding the minced meat into lemongrass skewers until they were like long lollipops on a stick. 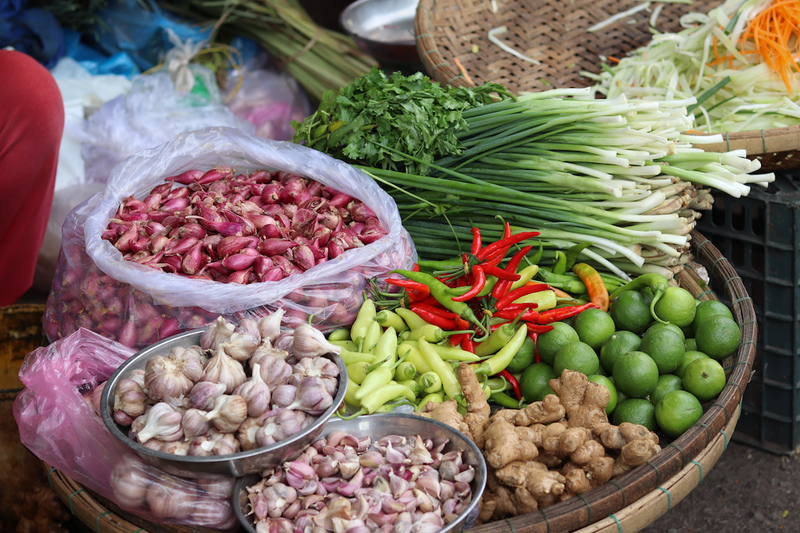 What impresses me the most about Vietnamese cuisine — actually, SE Asian cooking in general — is how many ingredients go into something as simple as, say, peanut sauce. No less than six ingredients (peanuts, peanut butter, sesame seeds, fermented soy (similar to a miso paste), sugar, and pork(!!) are used to assemble this “simple” and common dipping sauce. Two hours later, as we sat down to enjoy our first course — the lemongrass chicken served with rice — Ahn put the finishing touches on our other dishes and barbecue’d our pork on a small homemade grill outside. The food we cooked was delicious, and I’m not just saying that because we cooked it ourselves! 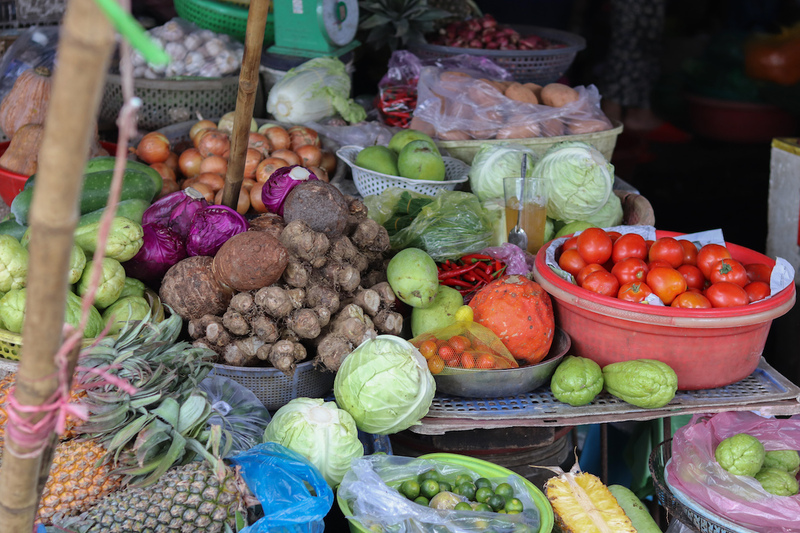 Seeing the market-fresh ingredients being prepared into traditional Vietnamese dishes with a ‘farm to table’ quality had us excited to finally eat our creations. Group cooking classes are at $29USD per person (with a vegetarian option for the same price) with a private class for $45USD per person. For more information about Hue Cooking Class / Anh’s Cookery, visit the website at: huecookingclass.com. Thank you to Anh for hosting us in his cooking class. As always, all opinions are our own on Modern Mix Travel.